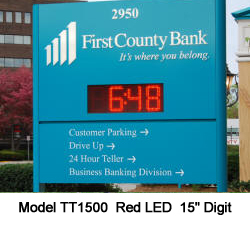 Salescaster® Time and Temperature LED Sign Series are a welcomed and much-needed addition to your outdoor signage options. The competitive offerings are too expensive, antiquated, or unreliable to compete with this state-of-the-art, lightweight, and feature-rich display. Our outdoor grade durable aluminum cabinet construction remains unmatched. 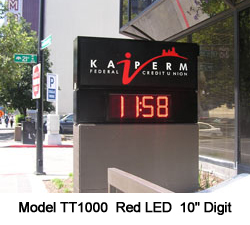 Enhance your existing signage and time stamp your company location with a Time & Temperature Sign. Custom cabinet sizes available for either front or rear serviceable units with an industry leading 3.75 inch cabinet depth. Ideal alternative for bank conversion projects that need to switch from older, costly and inefficient incandescent bulb technology. **Cabinets can be made higher and longer if required for retrofitting signs. ► GREEN TECHNOLOGY LED technology uses 95 percent less energy than other light sources. 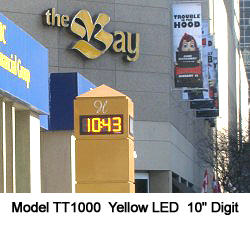 ► EFFICIENT Energy Smart LED technology is affordable, reliable and uses minimal energy. ► Rugged Outdoor Grade Aluminum Cabinetry less than 4″ Depth. ► Discrete LEDs provide wider viewing angle and daytime visibility. 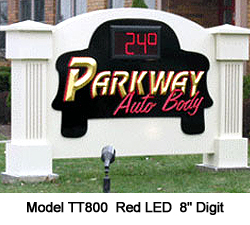 ► Non glare Lexan face for vadal resistance. ► High Impact Acrylic Lens Front for Protection. 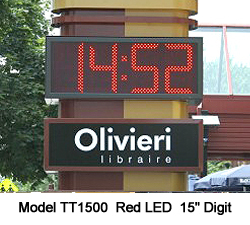 ► Alternating Time and Temperature Displays. 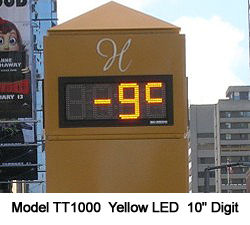 ► Temperature Display is Configurable: Fahrenheit, Celsius or Alternating F/C. 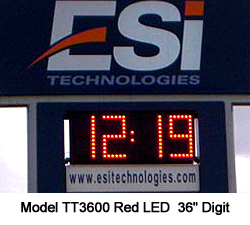 ► Time Display is Configurable: 12 hour or 24 hour Format. 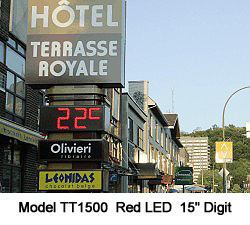 ► Operational Temperature Range: -22°F to +120°F. ► Automatically Adjusts for Daylight Savings Time and Leap Years. ► Digital temperature sensing for increased accuracy and reliability. ► Designed for Extreme Temperature and Humidity Applications. ► Battery Backup: Time Retention During Power Outages up to 10 Years. Although our products and customers have grown in number and diversity, our dedication and interaction with every client on which our business was founded six decades ago remains a cornerstone of our core business philosophy. 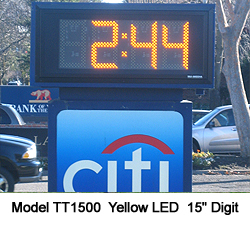 Our highly visible and commercial grade LED Displays ensure continued productivity and preventative safety throughout your workplace and production facility. Salescaster is experienced in helping customers define your needs and refine your ideas. We understand that every business has unique communication needs and priorities. Call 800 346-4474 and speak to a professional trained in the art of ‘listening’ and visual design. 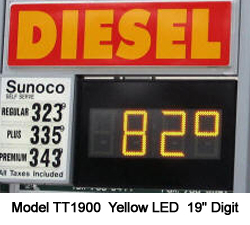 Green Technology – Display automatically adjusts LED brightness in relation to ambient light conditions.